Hurricane Sandy made US landfall near Atlantic City, NJ on 29 October 2012, causing 72 direct deaths, displacing thousands of individuals from damaged or destroyed dwellings, and leaving over 8.5 million homes without power across the northeast and mid-Atlantic. To coordinate federal rebuilding activities in the affected region, the President established the cabinet-level Hurricane Sandy Rebuilding Task Force (Task Force). The Task Force was charged with identifying opportunities for achieving rebuilding success while supporting economic vitality, improving public health and safety, protecting and enhancing natural and manmade infrastructure, bolstering resilience, and ensuring appropriate accountability. The Department of the Interior (DOI) Strategic Sciences Group (SSG) was established in 2012 to provide interdisciplinary science-based scenarios for environmental crises affecting Departmental resources. In January 2013, the Secretary of the Interior directed the SSG to support the Department’s participation in the Task Force. The SSG assembled a team of experts from government, academia, and non-governmental organizations – Operational Group Sandy (OGS) – to develop scenarios for the impacts of Hurricane Sandy and future major storms on coastal communities and urban systems in the New York/New Jersey region. 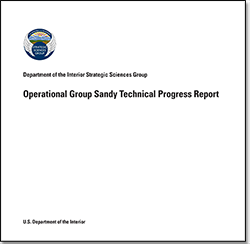 This report documents results from the March 2013 deployment of the OGS. It includes background information on Hurricane Sandy and the federal response; the OGS methodology; scenarios for Hurricane Sandy’s impact on coastal communities and urban ecosystems; potential interventions to improve regional resilience to future major storms; a discussion of scenario results; and lessons learned about the OGS process. It is recommended that users right-click and save the report to your desktop.